I just tried dyeing my brown suspenders black. Fabric dye is…a mess. And the ultimately it didn’t do that good of a job, even leaving the suspenders in there for 30 minutes. And to clean the stuff up, you’ve got to use bleach! I guess this is why stuff comes in different colors in the first place. I’ve resigned to buying a new set of suspenders (now that I can get them in black). But for future reference: dyeing…not recommended. I finished the final fabrication steps for the anthrolume rig. This includes securing all sub-harness couplings, threading the hand-controller, and vecroing a lot of parts together. I can still break the harness down into its six component parts for field repairs if necessary. I have to wear tight clothing because of the desired arm and leg strap locations – I’m wearing biking shorts and underarmor, which is perfect. I wore the suit for about an hour last night and while putting it on is a bit tedious, it’s actually quite comfortable to wear once it’s on. …because the electronics are done. Just now I put the final touch on the box that contains the controlling computer. 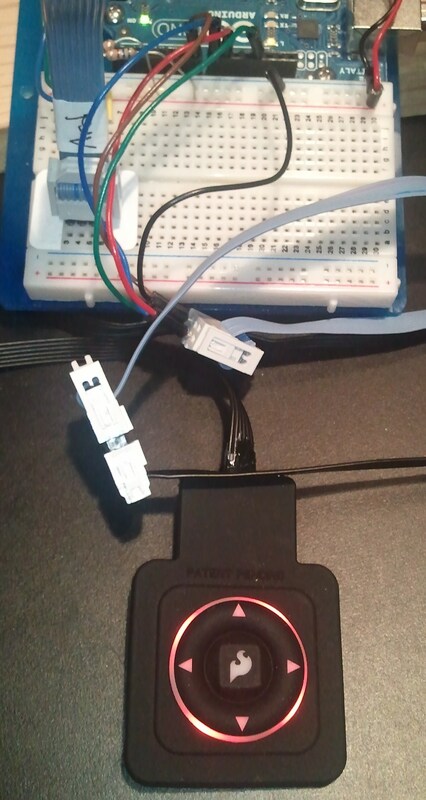 I added a jumper that lets me switch the LED buss power between the huge dedicated I2C batteries and USB power. The latter is handy for when I’m working on the software – typically I have the computer plugged into USB (there’s a hole in the left side of the box for that), and I don’t want to run the LEDs off the batteries all that time, so the jumper is great. 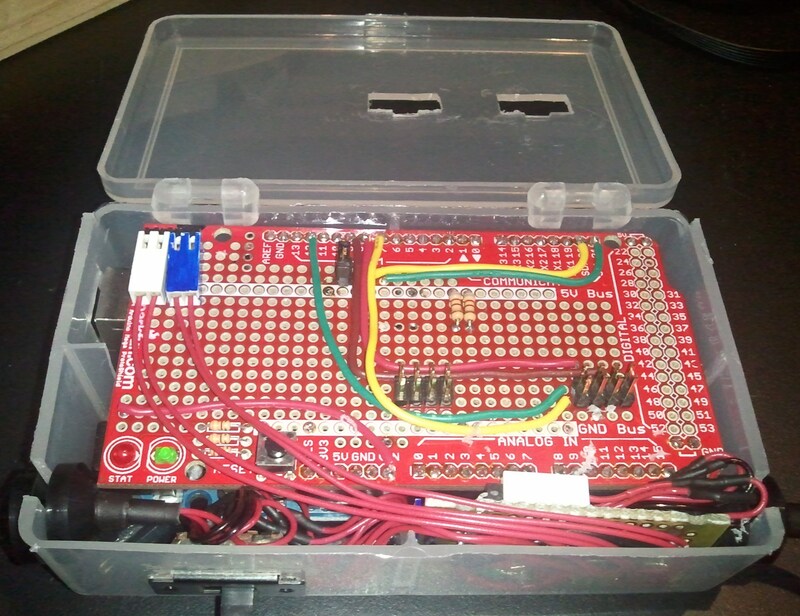 You can’t believe how tedious it was to build that red protoboard that’s attached to the top of the Arduino Mega microcontroller. For every wire on top, there’s probably two underneath. There’s just SO much packed in there. If (when?) I revise anthrolume to have the display and control options I originally envisioned, I’ll probably go to a bigger computer box, or multiple boxes. But the good news is that this box of electronics is, for now, completely done. Burning Man here I come! 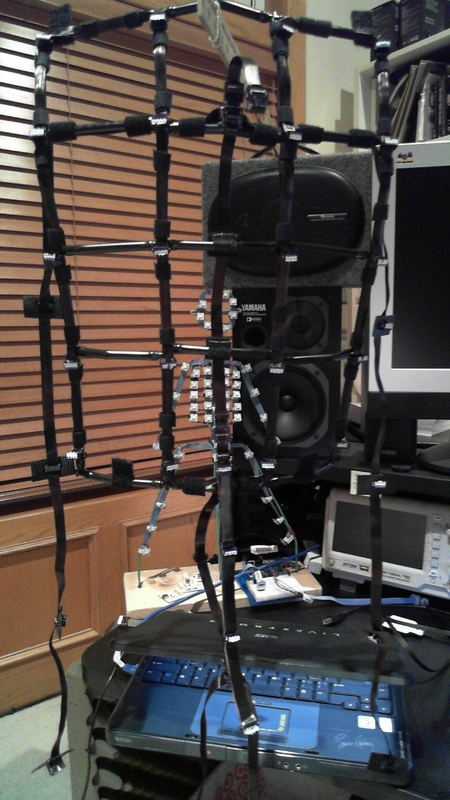 After three hours of solid fabrication, I’ve got the three mode LEDs in place, as shown below. This is part of my UI austerity plan – rather than an LCD, I’m reverting to three bicolor LEDs to indicate what’s going on with Anthrolume’s computer. Each two-wire LED is wired to two digital outputs on the Arduino, so if I set one to HIGH and the other to LOW, I get green, and if I switch it, I get red. And tri-state gives me more possibilities for making an otherwise rudimentary UI usable. I’ll post a demo video of mode switching with the keypad (which already works) after I’ve got the “pending mode” animation in place. The harness in final form. I spent the evening finalizing the harness. Given my groovy new strap design, I decided to kinda permanently fasten the whole harness together. This picture shows the arms, legs, chest, and lower spine all attached. The arm subharnesses are now attached to the chest frame. All the junctions between subharnesses are taped with his crazy-strong foam tape. If you watched the Presenting Anthrolume post, you my have noted the, um, swaying lower spine. That wasn’t my intention, so I have that thing reined in now. The head is still detachable, because I have two different hats to which it can be attached. Here’s a simple demonstration of my working tap tempo system and animation time-scaling. I’ve deliberately used a trivial animation for this demonstration, but the mechanism works for all my animations. Note: The recent dearth of posts has been a result of a little vacation to Florida. I’m back, and working away. I must have this project “done” by August 18, 2011. So that means I’ve got about five weeks to go. As a result, I’ve decided to scale back on a few of my plans. 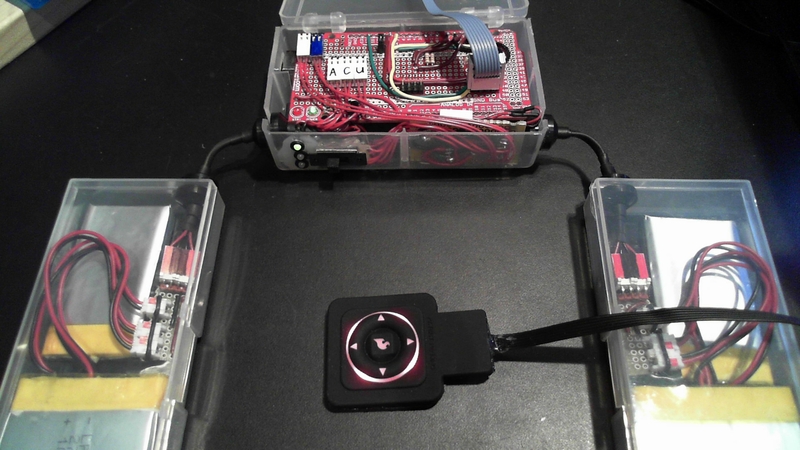 I designed a pretty good user interface for this project with a 20×4 LCD, bend and analog joystick inputs, finger buttons, and an encoder wheel. Sadly I have to shelve some of those plans for now, along with some of the more ambitious control mechanisms. I’m going to use something much more straightforward, but still ultimately satisfying. Utility which has some diagnostics that I can use to check the functioning of the suit, such as turning on all the LEDs to make sure they’re plugged in correctly. 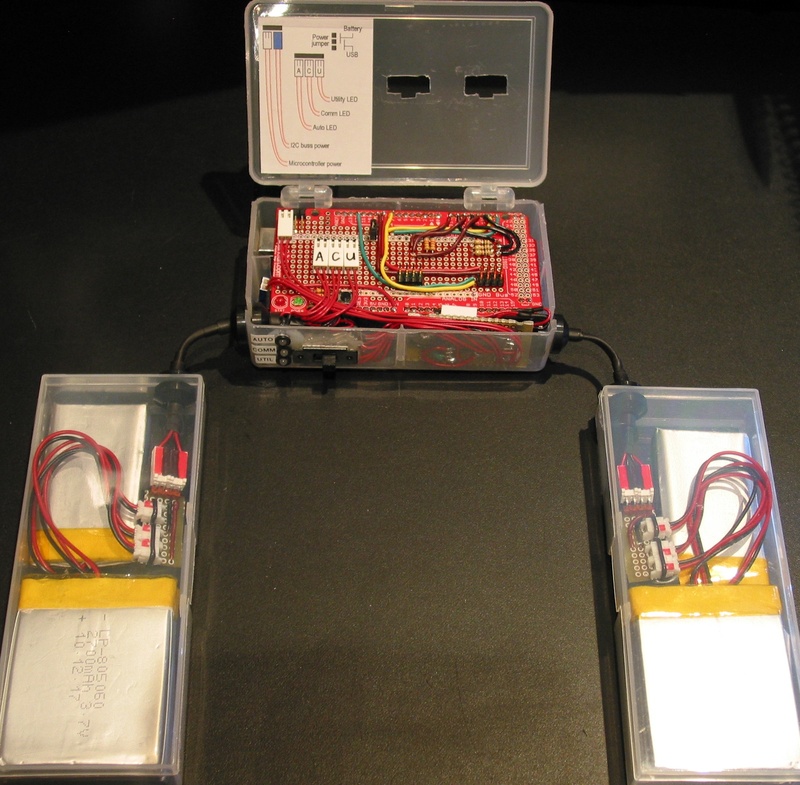 I will also have extended diagnostics available when the suit is connected to a computer via USB. For control, I’m using the weatherproof, five-button hand controller seen here. It has four directional buttons and a center button. It also has a red computer-controllable LED backlight. Over the weekend I wrote a nice class that I can use to get input from this controller and set the LED state and brightness. My class also allows detection of certain button combinations such as center+up and center+down which will allow a bit more control. Here it is connected to my little Arduino Uno for testing. I also modified the protoshield to accept the new connection to this device. It will run under the right arm straps to my hand. It’s kind of rubbery and has a nice feel to it. Another big piece of work over the weekend was the creation of a Beats class that implements a flywheeling tap-tempo system. I can tap the middle button of the controller in rhythm and my Beats class averages the taps to determine a tempo, then flywheels at that tempo. Since I have computer control over the backlight on the controller keypad, I set up a task to flash the red lights on the keypad in time with the beat. Now what I’m working on is making the animations time-scale to the current tempo. This is surprisingly easy, and it’s already partially implemented. I will probably be able to post a demo video of tap-tempo-synchronized animations Thursday night.